About a month ago I wrote a scene in the novel I’m currently pecking away at. As I formed the words I realized that I didn’t really know what I was talking about. What was I writing? A girl in a chicken coop collecting eggs. I grew up in the city. Seeing a squirrel jolting up a tree was about the closest I got to wildlife encounters. The idea of touching a fresh from the … ahem … oven gives me a bit of the heebie-jeebies. But my character isn’t the kind to be skittish about anything, let alone touching the underside of a chicken. “I’ve gotta touch a chicken,” I thought to myself. After hearing about my need to touch a chicken, I had several offers from my chicken owning friends (sososososo many chicken owning friends). “Oh, thank you,” I’d say, sorry I made it known that I needed to touch a chicken. 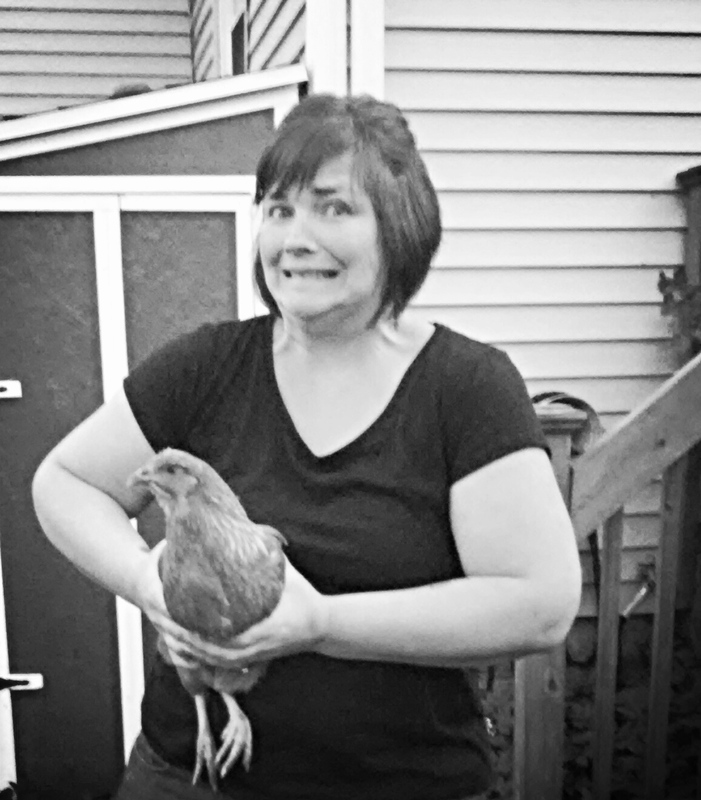 I’m going to be honest with you, my friends: I am afraid of chickens. They have razor sharp beaks, right? With long, gnarly talons. And they peck at people. And…and…I eat them. They might be able to sense how delicious I think they are. Then there’s the chance that a chicken might POOP ON ME! That was before I went to my friend’s house on Sunday. Anne Ferris is the owner of three diva chickens. Aretha, Allison, and Adele (like, after the singers). I’ve known Anne for about 5 years and still haven’t figured out one thing that she’s afraid of. Not joking. Me and Adele. The fear on my face is me being a goof. Adele is a redheaded sweetie. She didn’t mind me holding her one bit. She crooned at me as I held her (she doesn’t have quite the lovely pitch as her namesake, but that’s okay). Holding her was different than what I’d expected. Her feathers had a different texture than I’d anticipated. Her body was firm (I’ve got to find out what her workout regime is). I realized how I could write the scene in my book so that the reader would feel more inside the story. I’m so glad I held Adele. Next up? Snuggling a calf***. Henny Penny sounds like the hen in my book. Oh mercy. I’d be the unlucky one to be her first blood I’m sure. You are HYSTERICAL, Susie. I have a friend who would probably let you (not sure if she is your friend too) – I know she has cows, not 100% that there are currently calves. Will check your FB friend list and invite her to friend you if she isn’t already. I’m always surprised at how light chickens are. They are a combination of entertaining, gross (have you looked at their vents?! ), stupid, calculating, mean (ours pecked one of their sisters to death), and social. Our one chicken is getting lonely now that two of her sisters died recently. We’re thinking of getting a couple of chicks. Because we need more poop for the dog to roll in. Yes! I was surprised at how light she was. Ann, do you make your boys hose off the dogs after they enjoy a roll in the nasty? You are a funny and adorable city girl! Also courageous for venturing into the brave new world of farming. I was raised on an Iowa farm and at the age of 18, couldn’t wait to escape. If you want to know what it feels like to ride a big fat sow, hold tiny newborn mice in your hand, pluck feathers from a butchered chicken, or climb on hay bales, just ask. I’m also pretty good with the smells. Nothing like manure (aka poop) on a hot summer day. Love you! Riding a big fat sow??? Now, that’s a story I really need to hear, Denise!